UA students stand in front of a house they renovated in Moore, Okla., for tornado survivors. From the April 2014 Desktop News | More than a dozen students traveled to Moore, Okla., during spring break to participate in tornado recovery. The students worked with Cleveland County Habitat for Humanity to build homes for survivors of an EF5 tornado that struck the areas surrounding Moore in May 2013. It was the deadliest on record in the United States since the Joplin, Mo., tornado in 2011. 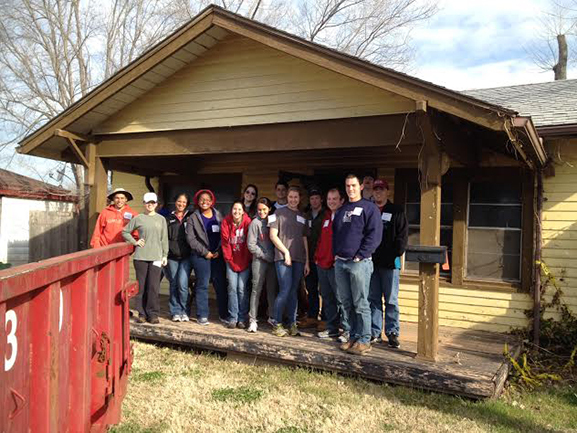 The Alternative Spring Break trip was organized by UA’s Community Service Center. Rachel Masterson, a sophomore majoring in psychology, said she participated in Alternative Spring Break because she wanted to do something different and productive. “I have gone on mission trips with my churches and participated in various volunteer activities over the years, but this was truly a unique experience,” Masterson said. “My favorite part of the trip was being able to make a family out of the most diverse group of people, my peers, and as a family, we made a difference. I was not at the University when Tuscaloosa was hit by the tornado in 2011, but I know the devastation it caused. I see it every day, even three years later. During their stay, the students gutted a house that would be used by AmeriCorps volunteers as a base site for tornado relief work, and the students worked on the interiors of two houses that would go to families who lost everything in the tornado last year. Angely Martinez, a junior majoring in international relations and French, said Alternative Spring Break provided her a way to give back to a community. “I enjoyed meeting new people and seeing how much we accomplished by working together,” Martinez said. For more information, visit www.volunteer.ua.edu.